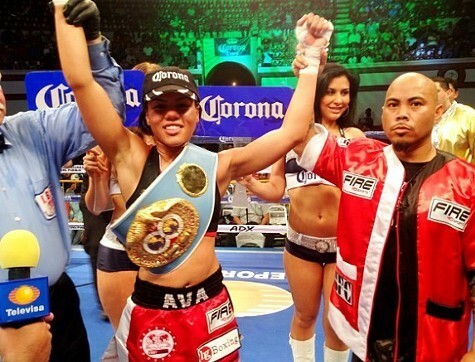 Boxing fans were all a-tizzy on Saturday night, after local flyweight champion Ava Knight successfully defended her IBF title for the second time — this time against Mexican boxer Susana Vazquez. The three ringside judges at Auditorio Centenario in Zaragoza, Mexico ruled unanimously in Knight's favor, awarding the 23 year-old Chico native for her speed, precision, stout defense and effective "stick," in the words of trainer Ben Bautista. That brings Knight's record up to 9-1-3, with 5 knockouts — including a particularly brutal drubbing of Arely Muciño in 2011. Knight remains one of the best female fighters in the world, but she still faces hurdles posed by the gender gap in boxing. Though they're gaining attention and pop culture catchet in light of the 2012 Olympic Games — which will include women's boxing for the first time — women fighters are still imperiled by a lack of visibility and paucity of resources, when compared to their male counterparts. Where as international celebrities like Mayweather and Paquiao can snag lucrative TV contracts, women's fights are seldom, if ever televised, and as a result, they compete for a much lighter purse. But that hasn't stopped Knight, who says she's looking forward to testing her skill again soon.